What Are the Best Holiday Pokies Themes This Year? Home » Answers to Common Questions » What Are the Best Holiday Pokies Themes This Year? 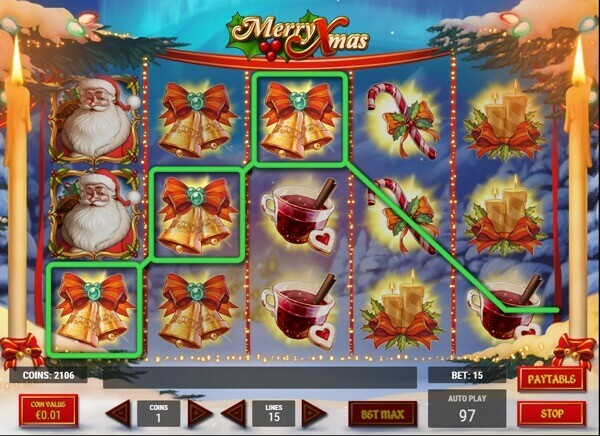 As the holidays draw nearer, Christmas themed slots are invading online casinos. From Santa Clause to Quanza, every imaginable holiday variation is being incorporated into casino games. This is far from surprising, since Christmas is the most lucrative holiday of the year. This December Australians are expected to spend over $25 billion on holiday amenities. These larger than life spending habits are too enticing for game developers to resist. Intent on cashing in on this seasonal bonanza, online casinos have introduced a slew of holiday themed games. Out of all the online casino games, none have become more festive than pokies. On top of being the most popular casino games online, they are also the most lucrative. The rapid pace of the games allows punters to wager multiple bets without thinking twice. The popularity of pokies revolves around vibrant graphics and fun themes, which makes them perfect for showcasing Christmas spirit. Developers haven’t missed this, and have unveiled plenty of epic pokies themes just in time for the holidays. These games are so appealing that even the most jaded punter can’t help but indulge in them. While finding holiday pokies themes is easy, picking the best games is surprisingly challenging. Thanks to the resounding demand, the market is completely oversaturated with games that cater towards Christmas. This never-ending amount of holiday releases makes finding the best pokies games a daunting task. Fortunately, quality games eventually get the recognition they deserve. To highlight the best holiday themed pokies available, we created this list. There’s no time to waste during the holidays, so quit guessing and only play the best pokies themes! Dive into a timeless Christmas classic. 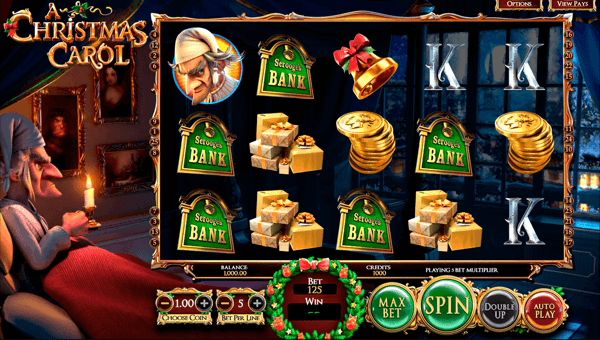 Pokies Release #1: A Christmas Carol – When it comes to 3D casino games, this non-progressive pokies theme steals the show. Utilizing cutting edge graphics, Betsoft brings Charles Dickens’ 1843 novel to life. Punters get to accompany Ebenezer Scrooge as he tries his best to conserve his hatred for Christmas. Users get access to 25-paylines and 5-reels that are bursting at the seams with familiar features. From helpful ghosts to bags of cash, the reels light up with highlights from this treasured holiday tale. There are enough bonus rounds to make anyone love Christmas, so join Scrooge on his holiday transformation! Enjoy a burst of holiday cheer! Pokies Release #2: Merry Xmas – After a few minutes of playing the game, it’s obvious that Play N’ Go went the extra mile with this holiday release. 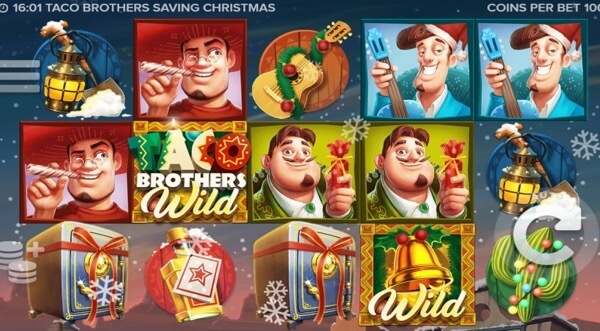 From the vibrant graphics to the larger than life potential prizes, this pokies theme embodies the spirit of Christmas. Punters get access to 5-reels, 15-paylines and a top jackpot cash prize of 187,500 coins. These enticing features are complimented by a generous 95.8% return to player, which makes it perfect for the holidays. It doesn’t get more entertaining than this vivid portrayal of Christmas, so add a festive touch to your gaming routine! Pokies Release #3: Taco Brothers Saving Christmas – Sometimes the best reprieve for the holidays is a downright silly pokies theme. ELK Studios gave punters an unusual treat with this outrageously unapologetic storyline. This quirky game follows the Mexican brothers Pico, Pepe and Paso as they try to save Christmas. Users have to help them stand up to the psychotic villain who’s stealing tacos, Captain Diaz. Even though the premise is absolutely ridiculous, this game packs enough surprises to keep the reels spinning. On top of sporting decent graphics, Elk Studios created over 243 ways for players to win. This game is a welcome escape from more serious releases, so let loose with a silly holiday adventure! Who are casino dealers and can I become one? What is the technique to shuffle a pack of cards in Blackjack?